God, the Universe and Everything Else (Amazon) is an educational colloquium, attempting to uncover a grand unified theory of the laws that govern the universe. This enlightening program delves deep into topics such as the Big Bang Theory, the expansion of the universe, black holes, extraterrestrial life and the origins of creativity. 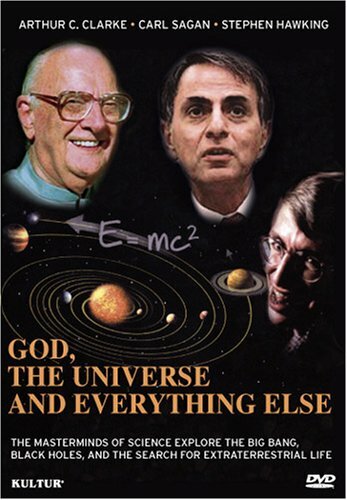 Featuring: Stephen Hawking, Carl Sagan and Arthur C. Clarke. Hosted by Magnus Magnusson, the longtime host of BBC's Mastermind program. Stephen Hawking is a British theoretical physicist who has dedicated much of his life to probing the laws of time and space described by Einstein’s Theory of Relativity. Carl Sagan was an American astronomer who played a major role in the development of the American space program, as well as his contributions to planetary science. Arthur C. Clarke is a British author, most famous for the science fiction classic, 2001: A Space Odyssey (Amazon), and his optimistic vision for mankind exploring the galaxy. Hawking is the first official autobiographical account of one of the World's greatest living scientists, Professor Stephen Hawking. Hawking's story, from his early days as a student through his battle with amyotrophic lateral sclerosis, to his status as a bestselling author, is narrated by the man himself. Hawking is released in the United Kingdom on September 20, 2013. The world's best known writer of science fiction, Sir Arthur C. Clarke was the first to propose satellite communications in 1945. One of his short stories inspired the World Wide Web - view his prediction in 1974 of the Internet and personal computer - while another was later expanded to make the movie 2001: A Space Odyssey (Amazon), which he co-wrote with director Stanley Kubrick. He had lived in Sri Lanka since 1956 and passed away in March, 2008. Read full transcript of the video here.